Salah Satu Veteran Death Metal kenamaan asal Cleveland, Ohio, yang eksistensinya sudah dikenal sejak band ini terbentuk tahun 1989 memang banyak menorehkan karya yang menjadi Inspirasi generasi selanjutnya, hmmm sosok profil penting yang layak banget kita kenal, jadi jangan hanya mengenal band2 saat ini, coz bagi kita semua, tanpa ada awal mana mungkin ada sekarang? hehehehe, sepertinya Label Independen yang cukup Idealis seperti Sevared Records tetep tertarik untuk menampilkan kembali karya2 mahadasyat di awal kebangkitan perkembangan death metal dalam sebuah album kompilasi Double CD Disk lagi, emang Top abis nih label pimpinan Boss Barret Amis yang tetep peduli dengan Root Death Metal Movement ! 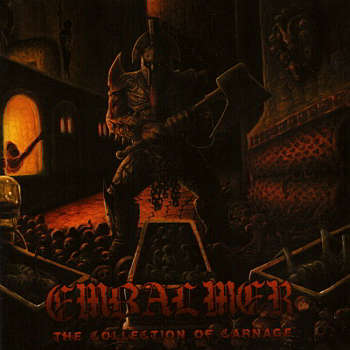 dan " The Collection Of Carnage " ini memang sebuah Audiography perjalanan Panjang Band seperti Embalmer ini harus jatuh bangun mempertahankan eksistensi hingga masa mengalahkan segalanya. and it's sort of unintentionally realized through the questionable competence of the songwriters themselves. The music has an almost unintentionally menacing quality created from the dichotomy of the chaotic and weird blasting sections and the sudden drops to loping thrash and power chord configurations. Due to the production, it's not nearly as riffy as it tries to be, so a lot of your attention ends up getting focused on everything occurring as layers of noise, like you're perpetually listening to the music at moderate volume while driving on the highway: you can hear the guitars and drums and vocals, but none of them seem to be articulating anything in particular. dan masih kita bayangkan sendiri jika Band ini mencoba memadukan gaya Death Metal Klasik hasil perpaduan Konsep antara Morbid Angel, Slayer, Autopsy hingga Obituary dengan mulai menambahkan Ketukan Hypersnare sana sini. dengan karakter Raw Sound, Embalmer ini cukup memberikan angin segar dalam perkembangan Death Metal itu sendiri. Lukisan keren Karya Seniman Sakit Jonzig pun akhirnya turut menghias Flashback sang Veteran Death Metal ini dan Artsleeve Layout-nya dikerjakan oleh Wim de Vries yang lengkap dengan Informasi setiap Track, sehingga kita benar2 sangat tau sejarah tiap lagunya yang terdapat di Booklet CD-nya. Kompilasi Dobel CD ini memang berisikan beberapa materi Demo, promo, CD serta beberapa materi yang belum pernah dirilis atau dipublikasikan sebelumnya yang secara lengkap disajikan untuk fans Embalmer. track 1 hingga 5 diambil dari Demo " Into the Oven " yang dirilis tahun 1991, masih begitu kita rasakan Raw Sound dan style death Metal Old School banget dan proses recordingnya terdengar Live banget hehehe, tapi sapa sangka loh kalo Tahun 1991 udah ada band secepat mereka .... Embalmer's music is firmly rooted within the bounds of (attempted) death metal rather than goregrind. Lalu " Projectile Vomit " adalah Materi yang tidak pernah dirilis sebelumnya direkam saat penggarapan Demo " Into the Oven " tersebut namun akhirnya tidak disertakan. track 7 hingga 10 dicomot dari Demo ke-3 " Rotting Remains " tahun 1993, yang secara Kualitas sound mulai terdengar lebih baik lagi dan Profesional, karena Demo ini dikemas dengan Kover Colour loh .... dan sempat nih demo dirilis kembali bersama Ep Pertama mereka " There Was Blood Everywhere " tahun 1996 oleh Relapse records, dimana nama Embalmer semakin menjulang dan diperhitungkan eksistensinya saat itu. dan 2 tahun kemudian tahun 1997, Ep ini dirilis dalam format CD kompilasi masih oleh Relapse Records. dan Baru ditahun 2006, band ini berhasil memuncratkan Full album pertamanya " 13 Faces of Death " Via Pathos Productions yang 3 lagu didalamnya adalah rekaman ulang dari materi Demo dan ini untuk pertama kalinya Frontman Gitaris Mark Davis tidak ikutan dalam formasi bersama Gitaris John "Jocko" Jermann dan tergantikan oleh Don Wolff dan Duane Morris, eksistensi band ini kian menjulang sekaligus mulai terlupakan dengan invansi death metal modern. lalu Track 11-14 dari Ep " There Was Blood Everywhere " yang disusul ma track 15-20 yang direkam live saat mereka tampil di Splatterfest Tahun 1992, walau agak Raw Kualitasnya, namun kita bisa merasakan sendiri aksi panggung band ini emang dasyat abis ! selanjutnya di CD ke 2 bisa kita dengarkan 2 materi lagu baru dari Promo 2012, terdengar sekali kalo Embalmer telah mengalami kemajuan yang signifikan dalam segi sound dan style, lebih cepat dan Brutal intensitasnya. Instead I feel that some madmen decided to kill someone and write music about it. And it actually sounds good too. This is definitely one of my favorite death metal/grindcore releases, and I don't know if I'll ever find something so sick and hateful yet at the same time catchy and listenable again. Embalmer are lunatics. selanjutnya Adalah Materi Full CD pertama " 13 Faces of Death " yang dirilis tahun 2006 dan materi terakhir CD ini adalah dari Promo 2009. materi disini telah mengalami Proses Mixing dan mastering ulang untuk kebutuhan Balancing audio saja tanpa banyak merubah beberapa karakter aslinya, sehingga tetaplah kita dapat bernostalgia dengan karya2 lama Embalmer. sebuah karya bagus dari masa silam dalam evolusinya tetap eksis. patut banget menjadi bagian koleksi death metal discografy kalian deh. This is definitely one of my favorite death metal/grindcore releases, and I don't know if I'll ever find something so sick and hateful yet at the same time catchy and listenable again. Embalmer are lunatics. One Veteran Death Metal famous native Cleveland, Ohio, whose existence has been known since the band formed in 1989 is a lot of work to be incised Inspiring the next generation, hmmm profile figure of importance it deserves our very familiar with, so do not just know the current band2, coz for all of us, without which there could be early now? hehehehe, Independent label seems quite Idealists like Sevared Records tetep keen to bring back karya2 mahadasyat early in the development of death metal revival in a compilation album Double CD Disk again, weve Top abis ya label Boss Barrett led the tetep Amis concerned with Root Death Metal Movement ! and "The Collection Of Carnage" is indeed a long journey Audiography Embalmer band like this to fall up until the time to maintain the existence trumps everything. and it's sort of unintentionally Realized through the questionable competence of the songwriters Themselves. The music has an almost menacing quality unintentionally created from the dichotomy of the chaotic and weird blasting sections and the sudden drops to loping chord thrash and power configurations. Due to the production, it's not nearly as riffy as it tries to be, so a lot of your attention focused on ends up getting everything occurring as layers of noise, like you're perpetually listening to the music at moderate volume while driving on the highway: you can hear the guitars and drums and vocals, but none of them seem to be articulating anything in particular. and still we imagine for yourself if this band were trying to integrate style Death Metal Classics result of the integration concept of the Morbid Angel, Slayer, Obituary by Autopsy to start adding Hypersnare knock here and there. Raw Sound with character, this Embalmer provide enough fresh air in the development of death metal itself. Cool painting work Artist Jonzig Hospital Flashback finally helped decorate the Veteran's Death Metal and its Artsleeve Layout done by Wim de Vries complete with information of every track, so we really know the history of each benar2 songs contained in the CD booklet. The double CD compilation does contain some material demo, promo, CD as well as some unreleased material previously published or presented in full to fans Embalmer. 1 to 5 tracks taken from demo "Into the Oven" was released in 1991, so we still feel Raw Sound and style of Old School Death Metal and the recordingnya sounded really really hehehe Live, but thought sapa tablets of 1991 if the band already there as soon as they .... Embalmer's music is firmly rooted within the bounds of (attempted) rather than death metal goregrind. Then the "Vomit projectile" is material never before released demo recorded during the cultivation of "Into the Oven" is, but ultimately not included. 7 to 10 tracks plucked from the Demo-3 "Rotting Remains" in 1993, which started the sound quality sounds better and Professional, because it's packed with Demo Coverage Colour loh .... and ya got re-released demos with their first EP 'There Was Blood Everywhere "in 1996 by Relapse Records, where the name of the tower, and calculated Embalmer existence at that time. and 2 years later in 1997, Ep was released in CD format by Relapse Records compilation yet. New and in 2006, the band managed memuncratkan first full album "13 Faces of Death" Via Pathos Productions 3 tracks therein are re-recordings of the demo material and for the first time Frontman Guitarist Mark Davis did not follow in formation with guitarist John "Jocko" Jermann and replaced by Don Wolff and Duane Morris, the existence of this band once more and began to forget the looming invasion of modern death metal. and Track Ep 11-14 of "There Was Blood Everywhere" which followed ma tracks 15-20 recorded live when they perform at Splatterfest of 1992, although slightly Raw quality is, but we can feel the action stage, the band's own terrible emang abis! subsequent to the second CD we can listen to two new tracks from Promo material 2012, there was once a reply Embalmer have made significant progress in terms of sound and style, faster and brutal intensity. Instead I feel that some madmen Decided to kill someone and write music about it. And it actually sounds good too. This is definitely one of my favorite death metal / grindcore releases, and I do not know if I'll ever find something so sick and hateful yet at the same time catchy and listenable again. Embalmer are lunatics. The next material is the first full CD "13 Faces of Death" was released in 2006 and the material is from the last CD Promo 2009. material herein has undergone a process of re-mixing and mastering audio Balancing needs without much change some of its original character, so that we can still reminisce with old karya2 Embalmer. a good work of the past still exist in its evolution. should really be part of a collection of death metal discografy you deh. This is definitely one of my favorite death metal / grindcore releases, and I do not know if I'll ever find something so sick and hateful yet at the same time catchy and listenable again. Embalmer are lunatics.